Ann Elizabeth was proud to participate in last weekend's "Light the Night" Walk sponsored by The Leukemia and Lymphoma Society. Ann Elizabeth walked with the Utah Salesforce.com team in support of "Team Lynn" - a co-worker currently battling cancer. Participants carried illuminated balloons and wore LED necklaces during the 1.5 mile walk held after dark in Utah's Sugar House Park on October 13th, 2012. The event raised more than $234,000 dollars to fight Luekemia and give hope to people battling blood cancers. 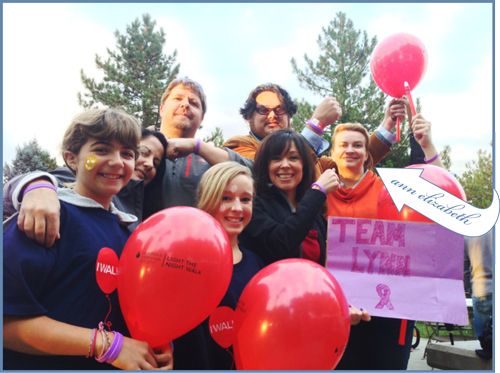 Thank You to the Salesforce.com Utah team for supporting a worthy cause. Ann Elizabeth was proud to walk with your team in support for a cure.